Researchers from China have turned a sheet of graphene oxide into a material that bends when exposed to moisture, which they used to create a spider-like crawler and claw robot that move in response to changing humidity conditions without the need for any external power. The researchers stated that "Our very simple method for making typical graphene oxides smart is also extremely efficient. A sheet can be prepared within one second". They also reported that graphene oxide sheets treated with brief exposure to bright light in the form of a camera flash exhibited reversible bending at angles from zero to 85 degrees in response to switching the relative humidity between 33 and 86 percent. They also demonstrated that their method is repeatable and the simple robots they created have good stability. While other materials that can respond to humidity exist, the team experimented with graphene-based materials because they are incredibly thin and have unique properties such as flexibility, conductivity, mechanical strength and biocompatibility. These properties have the potential to make graphene ideal for broad applications in various fields. For example, the material's excellent biocompatibility could allow moisture-responsive graphene oxide to be used in organ-on-a-chip systems that simulate the mechanics and physiological response of entire organs and are used for drug discovery and other biomedical research. The research team used a camera flash as a simple and effective way to create moisture-responsive graphene. It allowed the researchers to remove oxygen from, or reduce, just one side of a sheet of graphene oxide. When moisture is present, the reduced side of the graphene oxide absorbs fewer water molecules, causing the non-reduced side to expand and the sheet to bend toward the reduced side. If the material is then exposed to dry air, it flattens out. They team found that keeping the flash about 20 to 30 centimeters away from the graphene oxide sheet was enough to selectively modify the top layer of the sheet without penetrating all the way through to the other side. The sheet also needs to be more than 5 microns thick to prevent it from being completely reduced by the flash exposure. 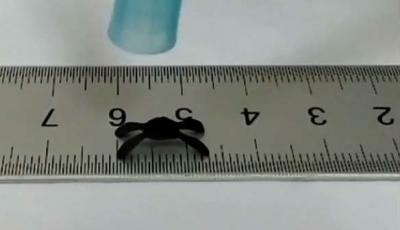 To make a moisture-driven crawler, the researchers cut flash-treated graphene oxide into an insect shape with four legs. The free-standing crawler was about 1 centimeter wide and moved forward when humidity was increased. Switching the humidity off and on several times induced the crawler to move 3.5 millimeters in 12 seconds, with no external energy supply. The researchers also made a claw shape by sticking together eight 5-by-1 millimeter ribbons of flash-treated graphene oxide in a star shape. When moisture was present, the claw closed within 12 seconds. It returned back to an open position after 56 seconds of exposure to dry air. "These robots are simple and can be flexibly manipulated by changing the environmental humidity," said the researchers. "These designs are very important because moving and capturing/releasing are basic functions of automated systems." The team added that integrating moisture-responsive graphene into a micro-channel system connected to humidity controller could allow even more precise control and other types of robots or simple machines. The researchers are now working on ways to improve the control of the material's bending and are experimenting with ways to gain more complex performance from robots made of moisture-responsive graphene oxide.